Which 2019 Audi A6 Is Right for You? The 2019 Audi A6 resembles a well-tailored suit with its sharp bodywork and refined cabin. It offers power, comfort, and control. Each trim, however, provides a better combination of safety, power, comfort, and performance. Do you want power or more luxury? Why not both? The Audi A6 Premium has a starting MSRP of $58,900. Since power is an important part of Audi’s brand, the A6 is equipped with a 55 TFSI 3.0-liter turbocharged six-cylinder engine that’s capable of producing 335 horsepower and 369 pound-feet of torque. The Premium model also features Quattro all-wheel drive. It gets relatively good fuel economy ratings of 22 mpg in the city and 29 mpg on the highway. It’s the least expensive option, which means the A6 Premium doesn’t have the top-tier features you’ll find in the other trims. That doesn’t mean it isn’t great, though! Some of the best features include Voice-control navigation, HD Radio Technology, and Bluetooth connectivity. Plus, additional standard features include LED headlights and heated exterior mirrors with turn signals. The inside is luxurious with leather seating all around the cabin. Drivers will also find heated eight-way power front seats, lumbar support for the driver, and driver’s front seat memory. Of course, safety is important to protect you and your investment. 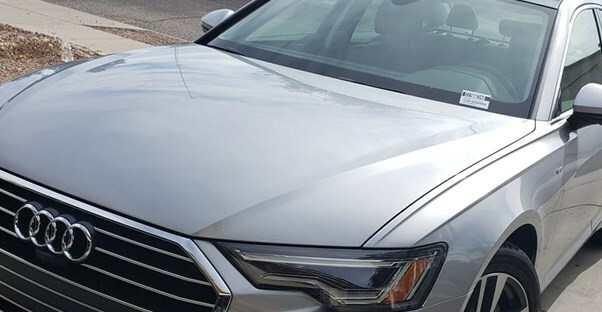 The A6 Premium has some pretty solid features in this regard, including rain-sensing windshield wipers, parking sensors in the front and back, and a safety unlock feature that unlocks your doors if the airbags deploy. It also has "Audi Pre-sense Basic," which helps detect and prepare for impending collisions. If it senses an imminent crash, the car will close the windows and sunroof, tighten the seatbelts, and prepare the brakes for quicker response. The A6 Premium Plus is the next trim, with a starting MSRP of $62,700. It has the same engine as the Premium so that drivers can expect the same capabilities regarding horsepower, torque, and mileage. So why the price hike, and is the upgrade worth it? The Premium Plus has a much better audio system featuring a Bose 3D sound system with 16-speakers, 15-channel amplifier, and 705-watts. This trim also features Matrix-design LED headlights with high-beam assist, wireless charging, and Audi advanced key-keyless start. Other standouts are the hands-free trunk release and dual center MMI touch displays. That's right. This car features two stacked touchscreens. The upper is a 10.1-inch screen, and the lower is an 8.6-in one. They display navigation plus traffic information. This trim also features a 12.3-in. High-Resolution virtual cockpit turning your whole dash into a screen that can display important vehicle information like your speedometer or a 3D map, making navigation a breeze. Safety improvements include the new top-view-camera system with a virtual-360 view. It also comes with lane change assist and rear cross traffic alerts. The 2019 Audi A6 Prestige starts with an MSRP of $67,100. It has the same engine as the Premium and Premium Pluss. So are all of the additional features worth the up in price? The inside of this trim sees upgrades with the addition of dark brown walnut wood around the cabin and power window sunshades for back, and side windows, dual pane acoustic glass. The Prestige also adds convenience features that can’t be found in the other trims. These include ventilation for the four front seats, a full-color heads-up display, and HD Matrix-design LED headlights with dynamic turn indicators with high-beam assistance. Additionally, there is four-zone automatic climate control, a power rear window, and power door and trunk closers that also come standard on this trim. Which 2019 Cadillac CTS Is Right for You? Which 2019 Toyota Avalon Is Right for You? Which 2019 Acura ILX Is Right for You?